Vibra-Tite acrylic (methacrylate) adhesives are a room temperature curing, non-sagging, 2-part system comprised of resin and activator. Our adhesives respond well to dissimilar materials and a wide range of temperatures. Forms a bond on: fiberglass, steel, aluminum, stainless steel, composite, ABS, PVC, plastic, wood, ceramic, glass, and more. General purpose. Adheres to most substrates. Rapid cure time. No surface preparation. High strength. High modulus. 100% reactive. Excellent resistance to hydrocarbons, acids and bases (3-10 pH), and salt solutions. 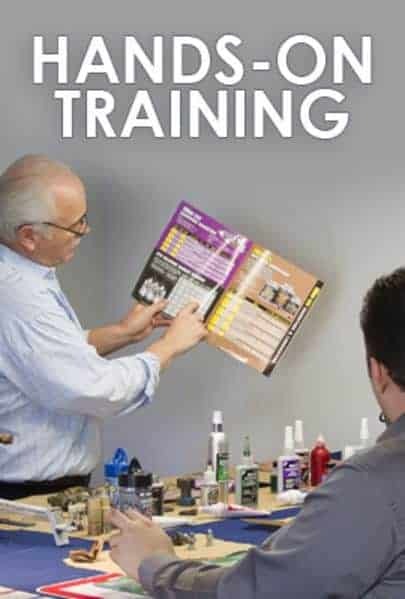 Use on ABS, Acrylics, Epoxies, FRP, Gelcoats, Polyesters, PVC, Polystyrene, Urethanes, and Vinyl Esters. 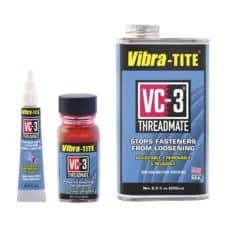 Vibra-Tite PB305 is a fast setting, high performance two part methacrylate adhesive engineered to bond a wide range of materials including metals, plastics, and especially fiberglass. It offers outstanding bond strength, is extremely durable, and exhibits excellent impact and weathering properties. Vibra-Tite PB305 greatly increases the reliability of finished assemblies with exceptional flexibility and its ability to with stand extreme temperature fluctuation and thermal cycling. 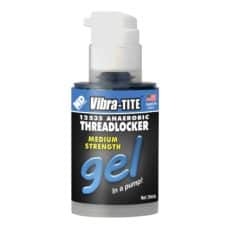 Vibra-Tite PB310 is a high performance two part methacrylate adhesive engineered to bond a wide range of materials including metals, plastics,and fiberglass. It offers outstanding bond strength, is extremely durable, and exhibits excellent impact and weathering properties. Vibra-Tite PB310 greatly increases the reliability of finished assemblies with exceptional toughness and its ability to with stand extreme temperature fluctuation and thermal cycling. Vibra-Tite PB320 is a toughened, medium cure speed, high performance two part methacrylate adhesive engineered to bond a wide range of plastics, metals, and composite assemblies. It offers outstanding bond strength, extreme durability, and excellent impact and weathering properties. Greatly increases the reliability of finished assemblies with its ability to withstand extreme temperature fluctuation, thermal cycling, and chemical / environmental resistance. Vibra-Tite PB330 is a high performance two part methacrylate adhesive engineered to bond a wide range of materials including metal and plastics, especially fiberglass. It offers a moderate amount of open time, outstanding bond strength, extreme durability, and excellent impact and weathering properties. Greatly increases the reliability of finished assemblies with its ability to withstand extreme temperature fluctuation, thermal cycling, and chemical / environmental resistance. 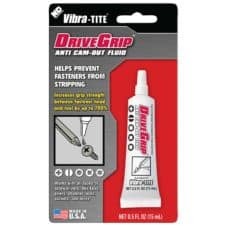 Vibra-Tite PB405 is a high performance two part fast setting methacrylate adhesive, engineered to bond a wide range of plastics, metals, and composite assemblies. It offers outstanding bond strength, extreme durability, quick setting, and excellent impact and elastic properties. Greatly increases the reliability of finished assemblies with its ability to withstand extreme temperature fluctuation, thermal cycling, and chemical / environmental conditions. Vibra-Tite PB420 is a toughened, fast setting, high performance two part methacrylate adhesive engineered to bond a wide range of plastics, metals, and composite assemblies. It offers outstanding bond strength, extreme durability, and excellent impact and weathering properties. Greatly increases the reliability of finished assemblies with its ability to withstand extreme temperature fluctuation, thermal cycling, and chemical / environmental resistance. Vibra-Tite PB422 is a toughened, slow setting, high performance two part methacrylate adhesive engineered to bond a wide range of plastics, metals, and composite assemblies. It offers outstanding bond strength, extreme durability, and excellent impact and weathering properties. Greatly increases the reliability of finished assemblies with its ability to withstand extreme temperature fluctuation, thermal cycling, and chemical / environmental resistance. Vibra-Tite PB425 is a toughened, slow setting, high performance two part methacrylate adhesive engineered to bond a wide range of plastics, metals, and composite assemblies. It offers outstanding bond strength, extreme durability, and excellent impact and weathering properties. Greatly increases the reliability of finished assemblies with its ability to withstand extreme temperature fluctuation, thermal cycling, and chemical / environmental resistance. Vibra-Tite PB530 is a toughened, medium setting, high performance two part methacrylate adhesive engineered to bond a wide range of plastics, metals, and composite assemblies. It offers outstanding bond strength, extreme durability, and excellent impact and weathering properties. Greatly increases the reliability of finished assemblies with its ability to withstand extreme temperature fluctuation, thermal cycling, and chemical / environmental resistance. Vibra-Tite PB320 is a toughened, UV stable, high performance two part methacrylate adhesive engineered to bond a wide range of plastics, metals, and composite assemblies. It offers outstanding bond strength, extreme durability, and excellent impact and weathering properties. Greatly increases the reliability of finished assemblies with its ability to withstand extreme temperature fluctuation, thermal cycling, and chemical / environmental resistance. Vibra-Tite PB320 is a toughened, slow set, high performance two part methacrylate adhesive engineered to bond a wide range of plastics, metals, and composite assemblies. It offers outstanding bond strength, extreme durability, and excellent impact and weathering properties. Greatly increases the reliability of finished assemblies with its ability to withstand extreme temperature fluctuation, thermal cycling, and chemical / environmental resistance. Vibra-Tite PB320 is a toughened, very slow setting, high performance two part methacrylate adhesive engineered to bond a wide range of plastics, metals, and composite assemblies. It offers outstanding bond strength, extreme durability, and excellent impact and weathering properties. Greatly increases the reliability of finished assemblies with its ability to withstand extreme temperature fluctuation, thermal cycling, and chemical / environmental resistance.